Cut each pipe cleaner with scissors into 1 (4-inch), 2 (1 1/2-inch) and 2 (1-inch) pieces. For each jelly bean chick, stack 4 of the netting squares. Pour 1/4 cup jelly beans onto center of netting. Pull corners of netting up over jelly beans to form bundle (this will form body of chick). Use 4-inch pipe cleaner piece as twist tie to tightly secure top, twisting ends to form beak. To form legs with feet, twist 1-inch pipe cleaner piece around each 1 1/2-inch pipe cleaner piece, 1/2 inch from end, to form foot with 3 toes. Insert opposite ends of 1 1/2-inch pipe cleaner pieces into hole of netting on bottom of chick's body (see photo). Trim top ends of netting with scissors into rounded shape to form head of chick. With glue, attach googly eyes to netting above beak. 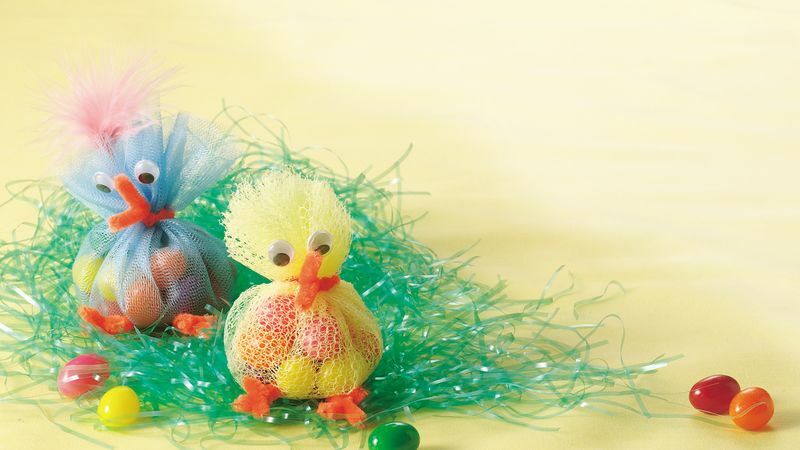 If children are involved with this craft, have all of the components in separate groups, ready for them to assemble the "chicks."